GREENSBORO, N.C. — What has four wheels, carries up to 18 mattresses and makes house calls? It’s the “Mattress Mobile,” operated by the Spring Air licensee based here. Spring Air logos are featured prominently on the Mercedes Benz truck. One side pictures a happy family sleeping together, while the other features a young woman enjoying a good night of sleep on her Spring Air mattress. Grove said the company would like its dealers to visit the company’s showroom here, where the full range of Spring Air mattresses is on display and where the company can show its retailers the quality it builds into its sleep sets. He said the truck can carry up to 18 twin-sized sleep sets. The officials who arrive with the mattresses pull them out and set them up in the retailer’s store to present the line. Frank Grove Jr., the company’s chairman, said that when the Mattress Mobile comes calling, retailers feel that they should take a look at the beds that have been brought to them. He said the company generally sets up appointments for the truck but will occasionally make a cold call. Bill Ellington, the company’s director of sales, goes on all of the trips. In a pinch, the truck can be used to ferry an urgently needed or specially made mattress to a dealer. 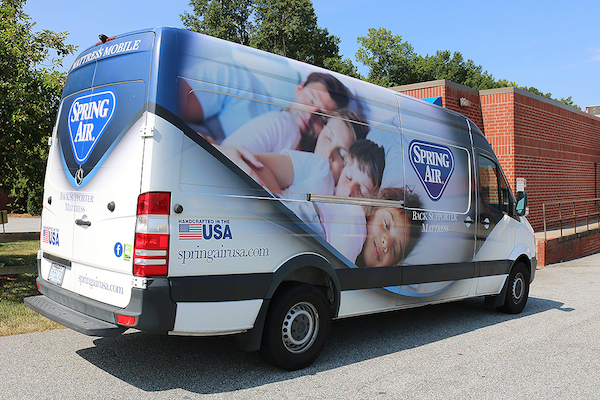 The service-oriented philosophy embodied by the Mattress Mobile impresses Rick Robinson, Spring Air’s corporate president. “That philosophy is the core of a family business,” he noted.